Spring Cleaning Kids: They Can Help! With spring just around the corner, we're all looking forward to extended daylight hours and the season's warmer weather. Spring cleaning should include age-appropriate chores for kids, too. We're planting flowers, airing out the patio cushions and checking the umbrella for mildew. In many parts of the country, though, it's not quite warm enough to move outside - yet. 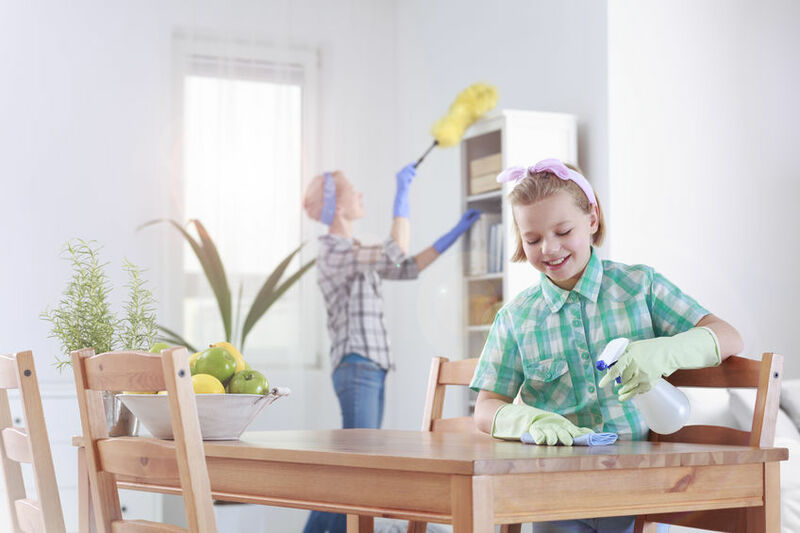 In the meantime, use cooler days to brighten up the indoors with a spring cleaning plan that gets the kids excited about this annual rite of home purification. Spring cleaning kids? Excited about cleaning? You're probably thinking there must be a typo in there! Nope, no typo. Yes, it really is possible, even probable, that your kids will not only get excited, but motivated and moving, too! The secret to getting kids excited about spring cleaning starts with - well, a game. So, to increase the odds of a successful spring cleaning with kids, two of my favorite cleaning games (one you can play with your younger kids, the second for older ones) are described below. If helping out with cleaning is a new concept for kids in your home, you'll definitely want to take the fun approach. It's worked wonders for my three kids, the oldest of whom is now 13 and does his own laundry. First however, you'll want to gather your cleaning supplies so you're ready for the kids and the fun and the spring cleaning to begin. Get a fun, colorful chore chart for the kids, like this one with sticker stars they can add themselves after completing a chore. Below I've broken down spring cleaning chores so that they're age-appropriate for your children. 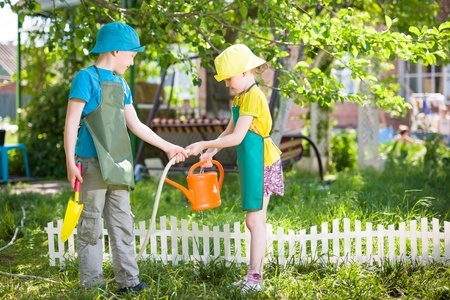 Kids ages 6 to 9 can help with spring planting. When it's time for a spring cleaning session, have the family don sweats and labor the day away dragging rags and pails. In the evening, the family puts on their "night-out" best and heads out to dinner and a movie, something everyone enjoys together. Looking forward to magical family outing makes even the longest list of chores palatable, especially when they're done together. Turn on your favorite upbeat music while you clean. Watch your kids howl as you sing along and do the Bump with the vacuum and the Macarena with the duster. You get the picture - a smiling group making short work of housework. Fill the house with positive energy, not grumbling. We rotate the DJ selection in our home to keep the peace. And we judge the results (say, a floor) not the mopper (the child), and everyone pitches in to make it a winner.